It is a liquid blend of organic electrolytes and micro-nutrients available to help accelerate microbiological activity in manure and plant waste composting, waste site storage, and other composting applications. 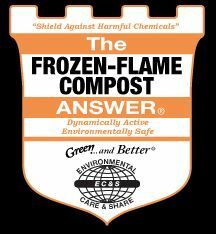 The FROZEN-FLAME COMPOST ANSWER® aids The Bio-Compost Answer, as it accelerates the microbiological activity within manure and plant waste composting, waste site storage, and other composting applications. The FROZEN-FLAME COMPOST ANSWER®is a liquid blend of water, organic electrolytes, micronutrients and polyglucosides. The homogenized polysaccharides as crystalline fructose and multiple glucose substances emulsified with multiple water-soluble trace minerals. The FROZEN-FLAME COMPOST ANSWER® biologically expedites the decomposition of waste during the composting process, as microorganisms depend on its carbon sources to generate electrical energy to break down organic matter. It directly supplies the beneficial microbes the food and energy need to break down manure, plant residues, and other organic materials into a valuable resource–– Perfect topsoil.